Fear, like the fog, slithers in and through and around. Fog leaves its damp trail on the roads and the lawns. It licks the trees and fences and guard rails. The damp taste of metal feeds its silence. It weaves its way, stopping here and there to coil around streetlights, headlights, traffic lights, blurring the edges and swirling one color into the other until all are none and none are one. Fear is a lot like that. Silent. It slithers through your brain, licking the edges of your confidence, its venom eroding the sand on which all of the bright and colorful facades are built. It blurs the sharp tall edges of the carefully constructed stories I tell myself and nibbles at the mice of my mind. 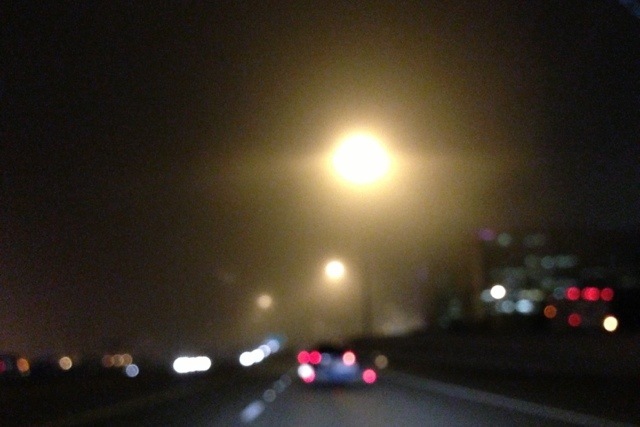 This entry was posted in rambling and tagged blurring the edges, fear, fog. Bookmark the permalink.